IshtyleAwhile - A Chennai based Indian Fashion Blog - Salwar Suits You Should Be Wearing This Monsoon Season! Monsoon is the season of weddings. 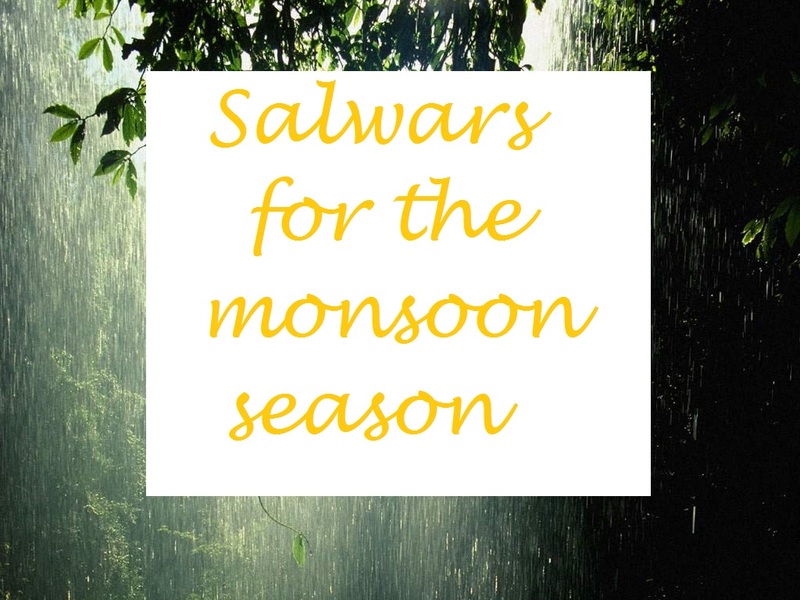 Monsoon is also the season of unexpected rains and occasional humid weather. Yet, you need to be looking your very best, be it any time of the year. 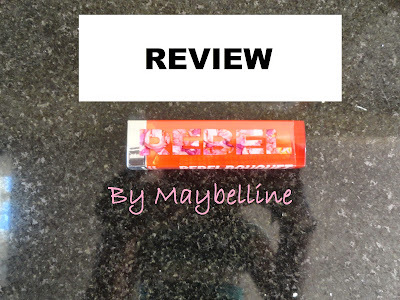 So, why not make some smart dressing choices that will not only give you a gorgeous and classy style but also be suitable to the weather outside? What you need is something that is manageable and easy to handle. A saree can become cumbersome in the monsoon. You need something light and airy to make you comfortable and designer salwar suits fit the bill perfectly! Salwar suits are perfect for any occasion. A good salwar suit is sure to enhance and accentuate your look. All you need to do is opt for cuts, designs and colors that will suit your body type and give you a flattering look. Forslightly plum women, dark colored and high-collared kurtas are best to create the impression of a leaner frame. The length of the kurta matters as well. Longer kurtas will make you look slimmer and taller. Choose your prints carefully! Bigger, bolder prints will draw attention away from your problem areas and therefore, give you a stunning appearance. Bright and solid colors add to a tall and slender frame. Nothing flatters a tall and lean woman like designer anarkali suits. Actually, to tell you the truth, an anarkali suit flatters every woman, provided you choose the length of the kurta to suit your height! Here are some of the salwar suit looks that you can try this monsoon season and look every bit the glam doll that you are! This one here is a purple semi-stitched Bollywood style anarkali suit that has a velvet border added to it. This floor-length suit is gown-like and the velvet fabric holds the look in place. It is bit heavy, but the velvet fabric adds richness to the look that makes it a perfect ensemble for a monsoon wedding. This is another long anarkali suit that is fresh and peppy with its light green color. This anarkali in net fabric makes a perfect amalgamation of zari work and embroidery, focusing on the neckline and the bottom border. The lightness of the kurta is offset by the heavily embroidered dupatta in the same color. The golden zari work adds the required oomph to this suit, making it perfect attire for a wedding reception party! Every woman must have a black salwar suit in her wardrobe. It not only looks chic and glamorous but black can be trusted to make you look great anytime! The color has a certain sophisticated yet mysterious aura that makes it look amazing when worn. You can choose this gown-style net border work suit. It has a very contemporary and modern look, different from conventional salwar suit or anarkali suits. The net material with the heavy gold embroidery towards the hemline makes for a rich look. The net border at the neckline with the small embroidered detailing is what makes this dress a hit! 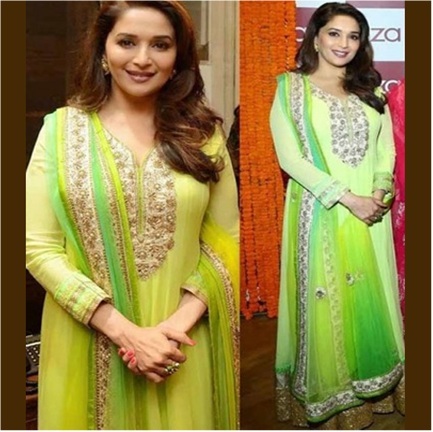 Editor's note- I swear that green anarkali that Madhuri is wearing just had me drooling. I really don't have enough anarkali's in my collection!! What about you guys? What Salwar suits are you sporting this monsoon season? Disclaimer- all images are sourced from the Internet. I do not own any of them. 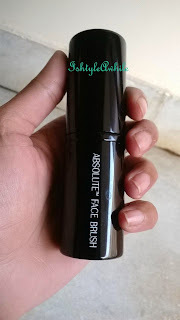 REVIEW: Lakme Absolute Face Brush.